In 3-quart saucepan, place potatoes and 4 cups water. Heat to boiling over medium-high heat; reduce heat. Simmer uncovered 8 to 10 minutes or until potatoes are tender; drain. Meanwhile, in small bowl, beat oil, vinegar, salt and pepper with whisk until blended. 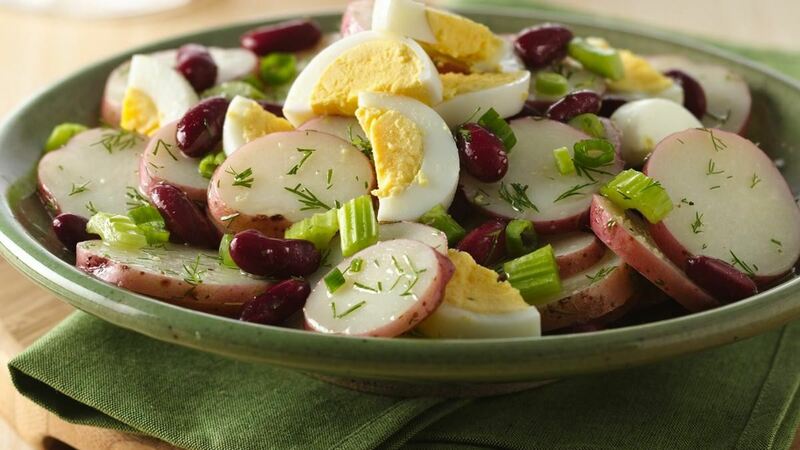 In large bowl, place potatoes, celery, dill, onions, beans and 3 of the eggs. Pour dressing over salad; stir gently to coat. Garnish with remaining egg. Let stand 5 minutes. Serve warm.